Every veggie seems to have its year. Last year was cauliflower (remember cauliflower rice….pizza….or the whole head cooked at once?) And this year…you already know it! Kale. 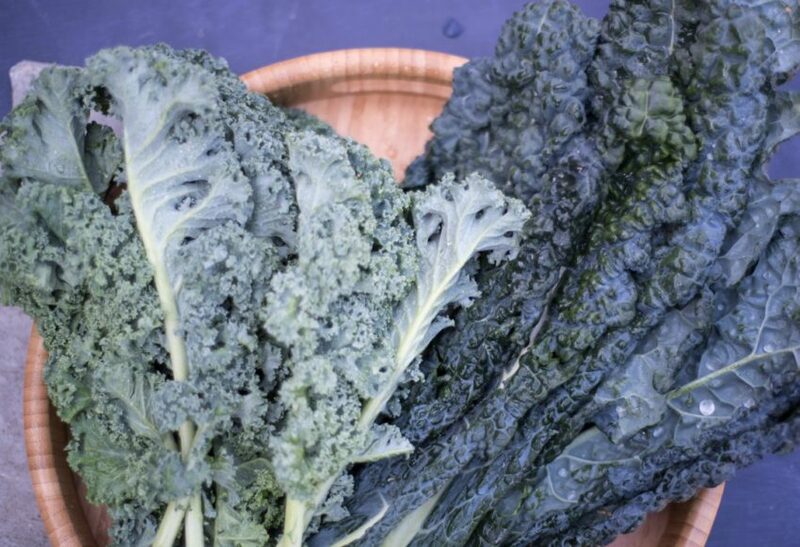 In case you didn’t know, there are a few versions of kale, and my personal favorite is Lacinato Kale – the Tuscan version of kale (the one on the right). It’s often used in Tuscan Bean Soup, because it’s hearty texture holds up well in broth. I used in it making Superfood Salad…and then I got an idea (whenever this happens my kids know they are going to be taste-testing recipes all day) – what if we grilled it? Yes, yes, yes! It worked like a charm. And it literally only takes a few seconds – just enough to get a grilled flavor on the leaves, and break them down just a bit. I then combined it with other end-of-the-summer flavors. 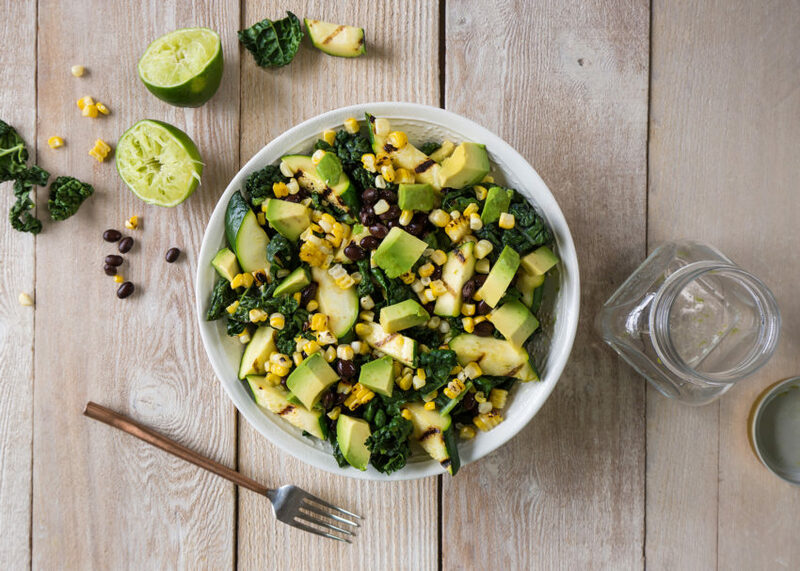 I can’t get enough of the black bean + lime combination, and of course anytime you have those two, you have to add??? Avocado. It’s like a law or something. So, I wondered if putting 3 “grill-able” vegetables together would make for a more rustic salad that even those who don’t have that appreciation for kale (that the rest of us obviously do) would love. And that worked too! The best part is they can all go on the grill together, they just come off at different times. The lime vinaigrette was made perfect with…jalapeño. You can add more or less depending on how hot you like it. I’m a bit of a wimp when it comes to heat, so I typically just grate a little bit of it into the vinaigrette. If you like a lot of heat, chop up the ribs of the jalapeño as well as the pepper itself – those contain the most heat! I created this recipe for @Albertsons @Safeway….and for those of us who have a need for summer salads, and an appreciation for all things grilled! …even kale. 1. Heat grill to medium high. Slice zucchini lengthwise into 4 quarters. Spray kale zucchini and corn with nonstick olive oil cooking spray or bush with olive oil. Sprinkle each with kosher salt. 2. Grill zucchini and corn cob for 5-10 minutes, rotating every couple of minutes, until good grill marks are on each side. Zucchini should be fork-tender, and may be done before corn. 3. Place kale leaves on grill for 30 seconds – 1 minute each side. Kale should just get charred and edges slightly crispy, then they are done! 4. Carefully chop zucchini, slice kale, and slice corn off the cob. Add to a medium bowl. 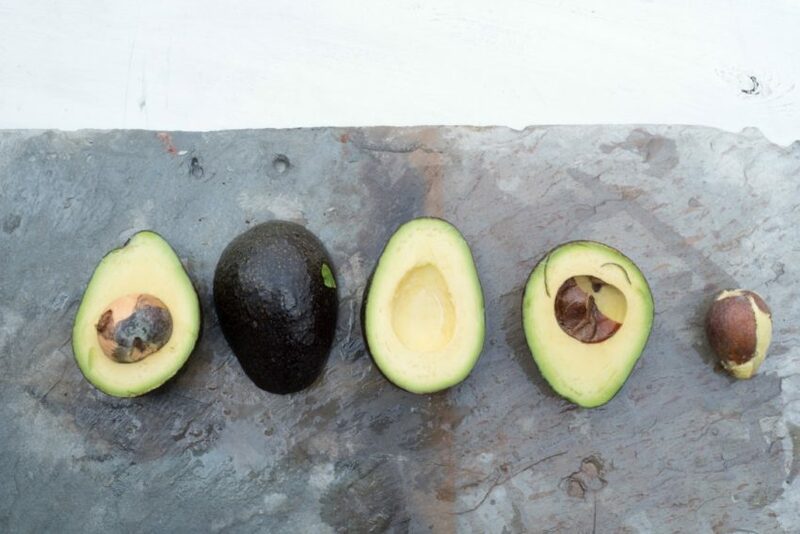 Toss in black beans, and scoop avocado on top. 5. Make Lime Vinaigrette by shaking the ingredients into a jar. Right before serving, pour Lime Vinaigrette on grilled salad. Enjoy! enjoy this as a main salad by itself, or paired with grilled chicken breast or steak. It also makes a great side salad at a get together! if no grill is available, corn, zucchini and kale can be quickly broiled in the oven or seared on the stovetop. It’s a close second choice!